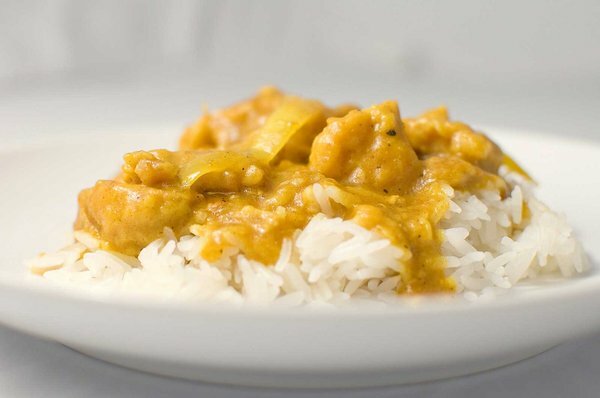 This savory chicken curry is sure to excite your taste buds and the exotic spices can act as a great metabolism booster! In a large heavy skillet over medium-low heat, put the oil and and diced onion, stirring until onion is translucent. Stir in the garlic, curry powder, and ginger, and continue cooking just until the garlic gets fragrant. Add the cauliflower, coconut milk, and water or broth, turn heat down to low, loosely cover the skillet, and simmer until coconut is fork-tender. Add the chicken to the skillet, stir, taste for salt and pepper and adjust seasonings to your liking. Simmer, uncovered, for another 5 to 10 minutes or until chicken is hot and the liquid has thickened a little and reduces slightly. Serve hot over rice, if that suits your diet. Otherwise, serve as is in bowls like a thick stew. Diets can get tedious. This dish is packed with powerful flavors to keep it interesting and to satisfy your hunger. The coconut milk does contain fat, but for many diets this fat is considered “good” fat. You may substitute other milk if that is more suited to your diet instructions. Serve over rice or eat with your favorite bread.